A few weeks ago I created a set of Christmas tags and I have to admit, I'm pretty proud of how they turned out! Since I love you all so much (and since you all but begged me on Instagram to share the tags) I have them for you as this week's Freebie Friday. The ornament and the wreath tag are about as straight forward print and cut as you can get. Just print and cut...on cardstock. I find a blade of 3 and a double cut work best for card stock. The snowman tag (sans the snowman) was printed on Silhouette chipboard using the default cut settings in Studio. Because you can't actually print 'white', I print and cut the snowman on white sticker paper and added it to the chipboard tag when it was done cutting. Just go ahead and download the free cut file and you'll be all set! Remember, these are for personal use only! Hope you had a wonderful Thanksgiving. Thank you so much for all you do to help us Sihouette users. My husband bought the Amazon Cameo starter bundle for $179.99 special for my Christmas present and was wondering if your Ebook was included. Thanks for the free Christmas tags! Would you please let us know the font you used on the round "Thanks for taking..." tag? Thanks, Melissa! Your tags are adorable! Thank you thank you thank you! I love the Sparkle & Shine and it will go fabulously with my wrapping paper! You SHOULD be proud of the tags - the are adorable! Thanks for sharing! Thanks so very much, these are lovely. Hope you have had a great Thanksgiving holiday. 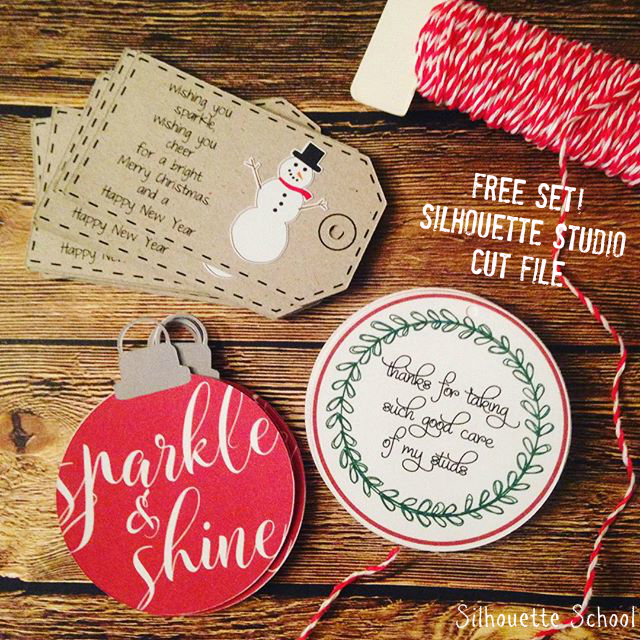 Thank you for ALL your Silhouette School Classes, and for sharing the many different free projects. I'm slowly going through your classes & am learning so much. You are very good at showing us how to get from a concept to actually getting the project done. Happy Holidays to you & your family. Thank you for blessing us with your talent and freebies! Thank you for so generously sharing your Christmas tags and your knowledge. You are great! Thank you so much for your generosity. These are great! Wonderful tags. Thanks so much for these and thanks so much for the time and energy you put into the Silhouette School classes. I have learned so much from you. Thank you for providing this to us! I m a new silhouette user and I'm wondering how to save these free designs to my silhouette studio? Can anyone help m out? Thanks so much! I can't get them to save or open either. Thank you so much - love them!! Thank you so much for sharing!! I love them!